Posted on January 2, 2011 by Mazur. This entry was posted in Preceden. Bookmark the permalink. Tht’s a nice lesson learnt. Wish you do great!! i believe a proper ab test could bring better results. I agree a live demo with limited access can would help a lot. And also get testimonials and rating from your old customers and showcase them. But nothing beats providing a Trial for Free. This is really interesting, but you need to test results like these for at least 3 months. I usually “look” at anything I buy for a while before I actually purchase it. Even if there isn’t a free trial, I’ll roll a purchase back-and-forth (especially those that are paid monthly) for weeks. I’ll check out comments, competitors, reviews, user submitted YouTube walkthroughs, etc, before plunking down the cash and committing to something every month. In my scenario, I would have seen the price change and thought “I should wait to see if any other prices are changing”. Whatever the reason, testing changes and measuring them for a long period of time is important. Online, time of year, weather, economic mood, trust, etc all play roles in purchase decisions. Fantastic feedback — thank you so much. I recently picked up a book called Always Be Testing which talks about the different types of customers. I believe you fit into the “Methodical/Analytical” category (same as me). The trick is coming up with a homepage that suites all the different personality types and that’s something I’m going to be experimenting with in the coming weeks. One thing though — I’m not sure the duration matters. It’s the number of occurrences that is important. For an extreme example, imagine you have a site that gets a million visitors a day. You don’t need to run a test for very long to get good results. Yeah, you gotta have a demo at the very least. I think a trial is best though, so they can actually fully use the product before deciding if it’s worth their money. I remember reading a post a few months back where someone did something similar (removing their free plan) but they still had a trial or demo or whatever – and the results were quite different. Revenue was up, and considerably so. I’m giving serious thought to a free trial period — I’ll let you know how it goes. One mistake I made was not adjusting the copy on the site to reflect the new business model. There’s definitely a different approach you need to take when you nix the free plan. wow I’m not a web developer or anything but the business lessons learned from your experience and test are great. Am facing the exact same dilemma for a news aggregator I am developing. Appreciate the insights. Thanks for this generous case study. We delayed providing a freemium sample of our online courses for content authors, but it’s popular. We’ll monitor it much more closely from now on. Thanks for the insight – I have been really debating this subject with a few friends, but real data makes this a much easier decision. Thanks for sharing Matt! For now, I can’t tell. I decide to go 100% free on http:/www.pocket-locator.com to test donation model. Some says people donate. For now, I must say it’s a $7 epic fail but since it’s a good demo for my consultant job it’s ok. But I’m looking for a good business idea for such freemium small services. I have a demo page. 70 members in 3 weeks. Great post Matt. The lift from freemium is impressive isn’t it!? We shared this on our twitter feed. Ye Gods this is Flawed – yet still sooo tasty. Thanks a million – always testing ! Actually I dont really understand why did you try the “pay first” model in the first place. Was it just for the sake of the experiment? 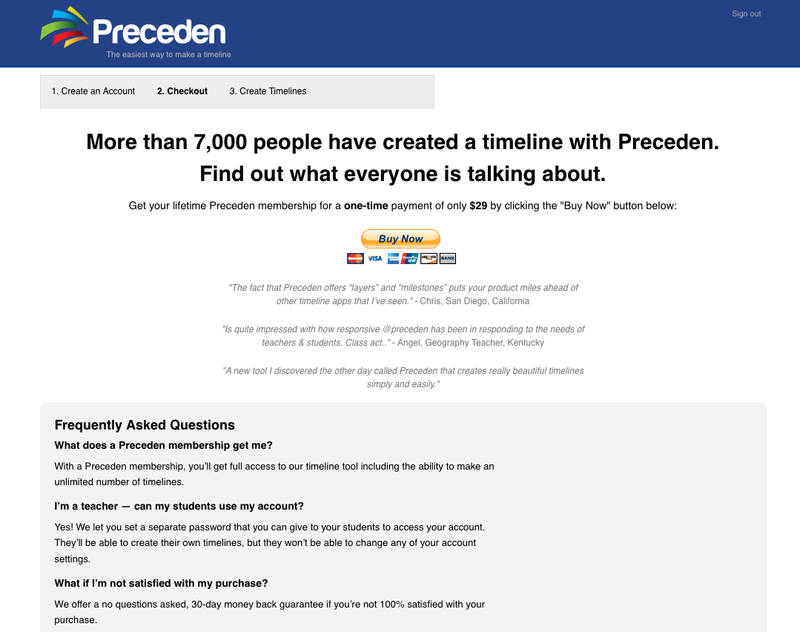 For a tool like Preceden, a free web-based timeline tool, which is not know from the manstream, it is difficult for ausers to accept to pay without even knowing how much useful it will be for him. I am even suprised you got registration during you testing, do you think it was people who got recommended by existing users? Also demo is super important! I would recommend video (<2min) rather than screenshots (quite boring). Good luck for your 4K usd/m challenge! It’s time to get paid! « I'm an Undertaker.